At 3:00 AM today I was up invigorated by my 11 PM – 1AM non-stop bike ride around the city and was discussing a few graphics for a header for a new site when I undeniably smelled smoke from something burning. I’d smelt it 10-15 minutes earlier and heard fire trucks but finally the smell become overpowering and I now knew there was a big fire somewhere in my neighborhood. After going around in circles for a few minutes trying to pinpoint the fire sirens (they were on the other side of a hill) I finally found them, over a mile away at Trull Street, off Hancock Street. Loyal readers will recall that Hancock Street was also mentioned in this cycling encounter. No, I don’t know if this house is in anyway related to the driver from that story but even if it was in no way would I wish harm on that person or his family. The fire must have been huge as there were a half dozen, if not more, fire trucks at the scene. By the time I arrived the firefighters had done an amazing job controlling the fire and had it nearly put out completely within minutes of my arrival. At that point they were mostly searching for anyone left in the house. The word on the street from people watching the scene was that everyone got out and firefighters were merely being cautious. Luckily it seems everyone made it out alive though I’m unsure of their conditions. 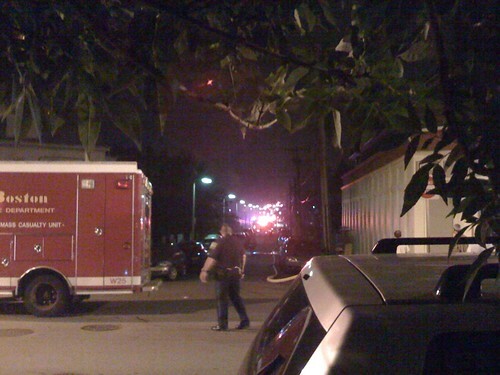 Here are a few pictures of the scene. My apologies for the sub-par quality; the pictures were taken with my iPhone which does not have a flash. A lot of fire trucks were there when I showed up. This photo is from Hancock Street looking down Trull Street. Here’s a photo closer to the home. The yellow at the top of the photo is a light or lights, not the fire, though there were flames near that light but the trees make it tough to see. 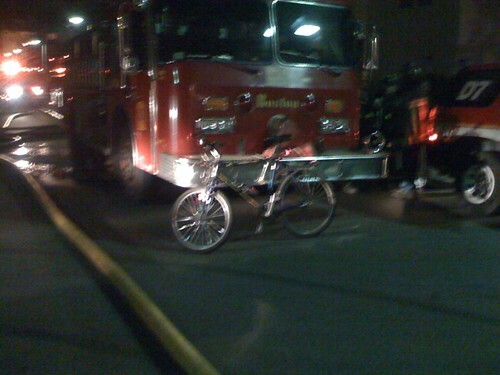 I did not know fire fighters also utilized bicycles but, as this photo shows, they do. Later on as I was leaving I saw a firefighter using the bicycle to get up Trull Street quickly to get to a supply van parked on Hancock Street to get a case of water bottles. 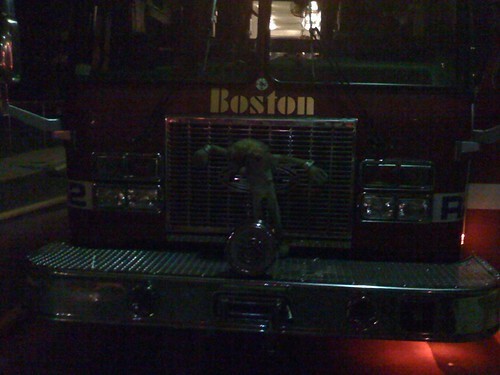 Finally, I saw this doll attached to the front of one of the fire trucks. All I know is I have the utmost respect and admiration for firefighters. Obviously they risk their life day in day out and though there are scandals (Boston recently had a firefighter collect disability pay while also moonlighting as a bodybuilder), the majority of fire fighters are hard working blue collar guys trying to help their communities. I didn’t ask but I’d assume this doll was either from a fire or from a family member for good luck. In either case it was a down to earth sign that firefighters are just regular people yet they constantly perform heroic acts. 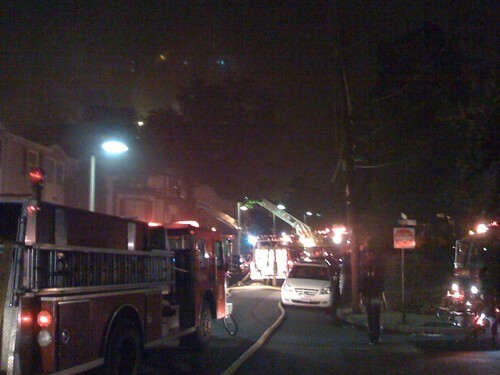 There’s a few more pictures from this fire on my flickr page. My condolences to the families involved in this traumatic event. Hopefully everyone made it out OK.
You did give me a good idea for biking though. I used to drive my “sports” car around at night as a way to almost meditate (ok I’m a bit of a car nerd). I think I’m going to try this. Haven’t seen anything about this fire on the news so I’ll take that as a sign that everyone is OK. When I was younger and still drove I used to do something similar though neither my ’91 Mercury Cougar nor my ’96 Nissan Maxima were “sports” cars. Yeah biking at night is a unique experience all its own. It’s very relaxing not having to deal with traffic and being able to just go at whatever pace you feel like. Just make sure you have lights on the front and back of your bike, here in Massachusetts the law requires a back light but both are good ideas. Also, be careful peddling by bars towards closing time. Several drunk people have tried to steal my bike once they realized cabs weren’t going to pick them up. They didn’t succeed but do not underestimate what a drunk person with no way home will do!